One of the comforts provided by faith and spirituality is the idea that our relatives remember us after they are gone. Regardless of what one might believe, this notion that the dead and living mutually remember, and look after, each other is just one way for the departed to survive beyond death, and lend comfort to those still here. That interconnectivity forms the backbone for strong legacies and family bonding that persists for generations to come. After all, we memorialize them in our own lives, so is it much of a stretch to think they do the same in their afterlives? Japan presents a somewhat unique “case study” when exploring notions relating to this idea. As a nation that has often been a nexus of converging cultures, it has developed numerous traditions and practices that reflect ideas related to the symbiotic nature of relations between the living and dead. 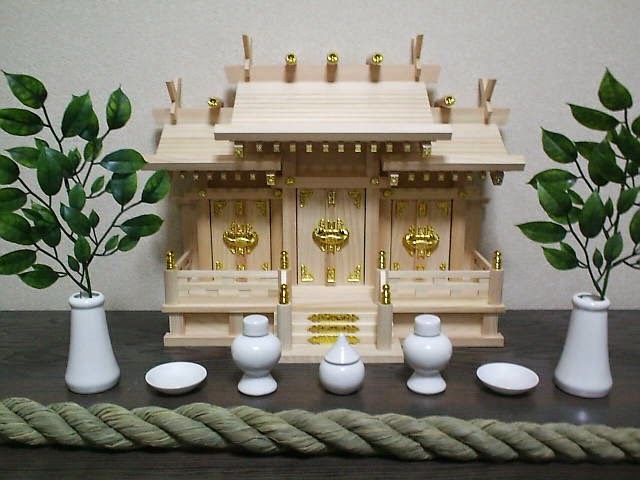 Practices like ancestor veneration have been part of both native belief systems (like Shinto) and incorporated systems (like Buddhism), and have real bearing on the everyday lives of Japanese people. Shrines, prayers, and formal ideas of remembrance might seem (or be construed as) ritualized, but in reality are often “just another aspect” of keeping the departed in the daily lives of family members. We’ve seen plenty of anime where characters bow their heads and clap their hands, or make slightly formal gestures in the presence of spirits or memorials to ancestors, but those simple actions feed into a much larger idea of how spirits and humans interact with one another. Ancestor veneration is nothing new in Eastern religions. From Hindu ideas of reincarnation to the (often terrifying) spirits that prowl Tibetan lands of the dead, ancestors hold a very special- and important- place in the lives of the living. Certain texts speak of keeping the departed close, so they can watch over their living descendants, keeping them safe from malicious entities. On the one hand, practices like this keep the spirit world in constant, often very vivid contact with the human world. But it also encourages family members to maintain ties to their past, keep their relatives in their thoughts, and keep their family together. Knowing that your beloved grandparents are watching over you might be all the motivation you need to pray in front of their pictures, or at least keep them close in your hearts. At the very least, it will prevent you from forgetting them amid the bustle of your day, and keep you that much closer to your heritage in a rapidly progressing world. 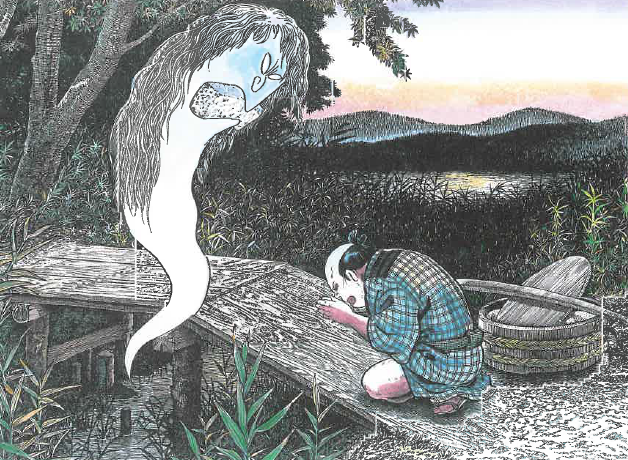 Shinto, for its part, advocates ideas of the “family kami,” whereby the spirits of dead ancestors collectively keep a silent watch over generations, ensuring at least some defense against yurei, wayward spirits, and concepts that could only be called “curses” because a better term doesn’t really exist. Through (often vague) series of exercises and established dates, the dead are remembered formally as a family, as a town, and occasionally as a nation- the distinctions between individual dead and the collective spirit is often blurry, with some towns viewing the collected dead of the entire community as its patron kami...or not. As Shinto is usually preoccupied with ideas relating to life, this is (unfortunately) as far as the “lore” goes in looking into the spirit world: death itself is corrupt, but the soul is eternal, so pay respect to the essence that was your loved one, and not the physical matter left behind. One look at the closest concept to an afterlife found in the Kojiki reveals a blasted hell-scape fit for no spirit or living being, but that look is itself extremely brief, and jarring to the kami who encounter it, then flee. Better to look towards the immortality of the spiritual being, than get lost thinking about the lands of the dead and rotting. After all, its those spirits who will be watching over you, and keeping you safe from the “monsters” that might escape from said underworld. Buddhism enhanced these ideas of family kami by offering a solid system that separated humanity into a physical and spiritual being. Rather than a vague notion of collective energy between family and community, Buddhist doctrine insists upon concrete afterlives, rituals that need to be obeyed, and learning from the ancestors. Often from the moment of death, a strict scheduling of sutras, behaviors, and memorials serve to sever the soul from the body- a fifty year process, according to Ian Reader- and provide it with forms of nourishment so that it might either pass on into the cycle of reincarnation, or become something closer to a guardian, keeping watch over future generations. This idea of the family guardian blends well with concepts from Shinto, in which the soul persists and protects, often without a sense of self or individual desires, aside from the need to be recognized and remembered. I am so-so-so-so sorry I forgot you existed. These influences have frequently been incorporated into much Japanese practice, because even while exploring the ideas of an indigenous Japanese identity, folklorist Yanagita Kunio recorded an instance where “...on the eve of the 14th day after the death of [an] old woman, close relatives gathered to recite buddhist prayers late into the night. Just as they were about to return home, they noticed the old woman sitting on a rock near the entrance with her back to them...” (Legends of Tono, 1910). 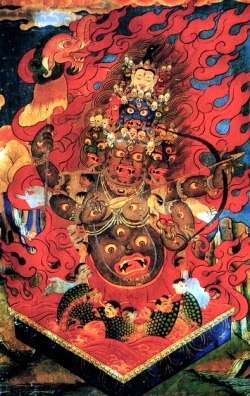 The intersections between the living and dead worlds was placed on stark display, and the villagers had to scramble to “rectify” a situation that had apparently “gotten out of hand.” And it shows how seamlessly Buddhist ideas had blended together with the local folk beliefs, creating a custom that persisted well into the 20th century. But thankfully, not all instances of encounters with the dead are frightening. More often than not, families gather around the household shrine, or at a place of significance in life, to remember fondly their departed, and celebrate the lives they lived. And sometimes, if they shared an especially close bond, those departed relatives do what they can to ensure the safety of those same family members. 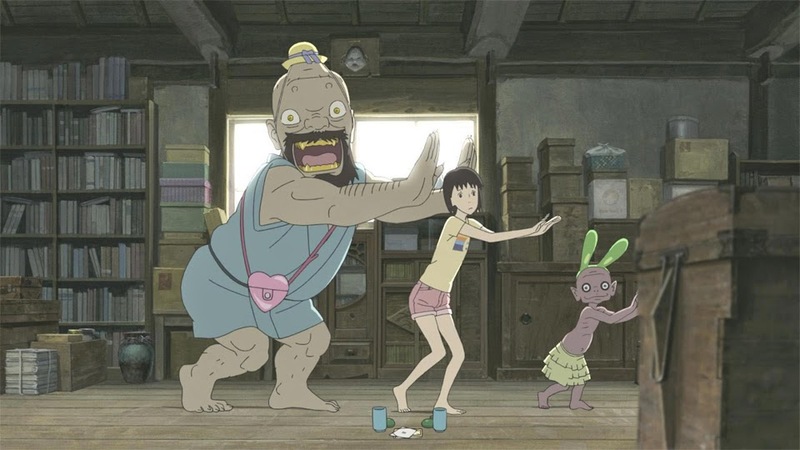 In “Letter to Momo,” the 2011 animated film by director Hiroyuki Oriura, one such instances serves as the catalyst for both coming to grips with bad memories, and demonstrating how a loving family member might reach out and protect those left behind. In the film, a young girl named Momo and her mother Ikuko return to a “simpler” life on an island off the coast where Ikuko once lived. This uprooting is later revealed to be the result of the death of Momo’s father, a traumatic accident further exacerbated by the last conversation Momo had with him, where she blamed him for putting his career in front of his family. It’s plainly clear that Momo regrets her decision, and that Ikuko is having trouble coming to grips with both her daughter’s surliness, and her own loss. They go through the motions for each other- praying for his spirit at their tiny shrine every day, trying to smile, or demonstrate how time moves on- but both are suffering. Momo regrets her harsh words, and her mother feels the need to be strong for the both of them. But in the process, their own family is breaking apart, as daughter mistakes Ikuko’s “nonchalance” as forgetting her father, and Ikuko mistakes Momo’s anger for something similar. Enter Iwa, Kawa, and Mame- three spirits tasked with looking out for the family. While they have taken the forms of local yokai for their interactions with both world and Momo, they clarify during the course of the story that they are in fact spirits “punished” for wicked deeds by being made guardians of the living. 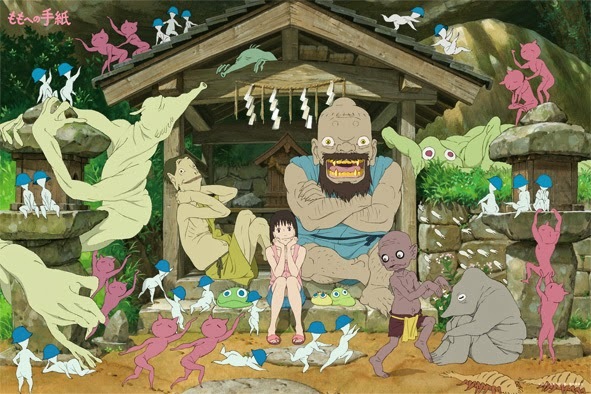 Since Momo’s father has not yet entered “up there,” (the film actually does not mention exactly what “up there” refers to, leaving for a lovely sense of ambiguity to be filled by the viewer in question), he sent them down to ensure the safety of his beloved family in the interim, while his soul is made ready to become part of the ancestral kami. He loves them dearly, even beyond life, and needs to know they are safe while he begins on the next phase of his existence. Though their presence in Momo’s life is more nuisance than benefit, they do mention the general gist of their duties to the girl who can oddly perceive them...eventually. They follow both girl and mother around the island (eating everything in their paths as they go). When Ikuko is threatened, they jump (albeit reluctantly) into action. When Momo “loses” the letter her father began writing to her (which was also the fault of those same guardians), they find a way to both return it, AND get a message across from the other side. They provide a connection for Momo to her lost father, and a bit of comfort while both she and Ikuko endure the worst of their loss. Plus they teach her a new dance. While they perform their duties badly at times, they still mange to perform them, keeping Momo and her mother safe until her father can successfully take over. It illustrates the importance of family in both this world and the next, and emphasizes the importance of understanding, forgiveness, and love between relations that forms a powerful connection in both the spiritual and physical worlds. The idea that Momo’s father has the power to send them down, and eventually will have the ability to perform those tasks himself, adds a more concrete element to a very abstract idea, but also adds a touch of humanity. While we might say that our loved ones watch out for us, in the case of this film, they really truly do. And belief can be a wonderful, very powerful thing. But at the very least, as long as we remember, we will always have them there to watch over us.